You’ve heard of Niseko and Hakuba when people talk about skiing in Japan but you might be surprised to find that Shiga Kogen, not yet so well known in world-skiing circles, is one Japan’s largest ski areas with 19 linked ski resorts all accessible on one ticket. The most important of any ski holiday, the Shiga Kogen Sun Valley resort is only a 30 minute bus ride up from Yudanaka station (about 840 yen one way). The season begins in late November and continues through to April/May. A full-day lift pass costs around 5,000 yen granting access to all linked areas with 50+ lifts and 4 gondolas. Night skiing is an optional extra depending on which area you’re skiing but goes up to 9pm most nights. There’s plenty of long runs and steep terrain over the entire resort to keep you going for a few days. Whilst most of the runs are suited to beginners and intermediate there’s still some steep terrain on the 2,000m high peaks to challenge advanced riders. If you’re going just for skiing and want to be able to jump straight onto the slopes everyday then there’s a number of hotels in the town of Hasuike and Oku-Shiga that might be suitable. The Oku-Shiga Kogen hotel was recently awarded the TripAdvisor Traveller’s Choice 2017 award for excellence in customer service. The Shiga Kogen Prince Hotel offers a more up-market experience. The night-life tends to be a bit sparse compared to the main villages which are at least 30mins by bus (depending on where you’re staying). The villages of Yudanaka and Shibu were established in this area as wellness spas for the well-to-do and samurai healing from wounds suffered in battle. The villages date back more than 700 years and are populated with quaint traditional Japanese inns (ryokan), temples, onsens and shops. Biyu no Yado, located just down the road from the Yudanaka train station is an excellent example of Japanese hospitality. There’s a private onsen bath on your balcony (Rotenburo) from which you can relax with a beer after a hard day skiing or sight-seeing. They also serve traditional Japanese course meals (kaiseki ryori) in your room. Sit down to dinner in your yukata and enjoy an array of traditional appetisers and mains that you can only experience in Japanese ryokan. Biyu no Yado is also close to local pubs, karaoke and other facilities. There are nine public onsens in the area as well as a number of “foot spas” (ashi-yu). It wouldn’t be a full Japanese experience if you missed out on joining the friendly Japanese in one of the big shared onsen baths for a quiet soak. There’s even a sake brewery in Shibu Onsen that offers sake tasting as well as craft beer. Hell’s Valley, named for the region’s volcanic origins and prolific onsens, it’s less than a 20min ride from most parts of the Shiga Kogen resort to the park. Despite the name’s associations it is home to Japan’s world famous “Snow Monkeys”. 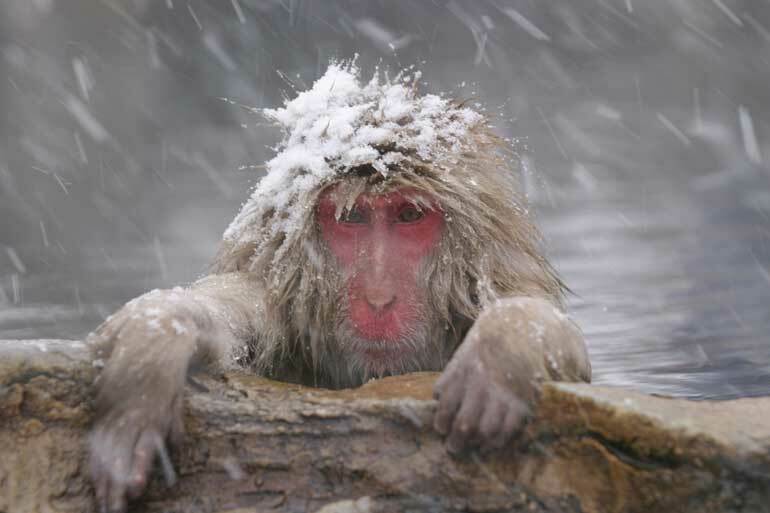 The Snow Monkeys are macaques native to Japan rather than the wild imports you might suppose. The park was established in 1964 and made famous on the 1970s cover of Life Magazine. The monkeys are famous for their daily frolicking in the hot springs. Perhaps that’s where their red faces come from given how hot some of the springs can be. The park is essentially a conservation area rather than a zoo and the monkeys roam freely throughout the area without cages and fences so you can get right up close to them. Whilst there are a number of smaller local temples (jinja) in nearer to Shiga Kogen the grander Zenko-ji temple in Nagano city (30 mins by train from Yudanaka) is only a 5min bus ride from the station. Zenko-ji is a national treasure, more than 1,400 years old and the 3rd largest wooden temple in Japan. Even if you’re not interested in religion it’s worth going just to see the architecture and shop for gifts at the local market stalls and souvenir shops in the temple district whilst eating a hot vegetable dumplings (oyaki). Bullet Train – When in Japan it should be a must to ride the bullet train at least once. On a Japan Rail (JR East) pass you can ride the Hokuriku Shinkansen for free (unreserved seats) and it’s only 2hrs from Tokyo to Nagano city. Then a 40min bus ride up to Yudanaka. Highway Bus – There are several highway buses that run between Tokyo and Nagano. The trip takes about 3.5hrs to Nagano city plus the 40mins up to Yudanaka. Shuttle / Taxi – There are taxi services from Tokyo airport however these require pre-booking and can be quite expensive but it does take some of the worry out of things since they’ll take you straight to your hotel.